12:27 pdurbin It's hard to imagine non-geeks even thinking to look for file systems that some how spread out the wear across solid state drives. 12:28 pdurbin I'm not sure how free software leaves your data untouched but proprietary software touches it. 12:28 pdurbin The bit about helping (network effect) should be moved to the end, after the reader has been convinced of the argument. 12:30 pdurbin The surveillance argument is probably the most compelling. The section assumes the reader followd the Snowden story and it's aftermath fairly closely though. 12:31 pdurbin EOMA68 should be explained better. I'd never heard of it. 12:32 pdurbin Any why are proprietary software suppliers unwilling to provide binary blobs for it? It that true? 12:34 pdurbin The ".doc a binary blog" argument has been weakened (years ago) buy the introduction of .docx, which is a zip with XML in it. 12:37 pdurbin I find the definition of "ease-of-use" strange. Doing tasks for the user vs automating them? To me ease-of-use has to do with user experience (UX) and the formal definition of usability. ISO 9241: "The effectiveness, efficiency and satisfaction with which specified users achieve specified goals in particular environments." 12:38 pdurbin It's cool that the author is thinking about running Friendica or similar. 12:41 pdurbin I find the statement "I believe that art should not be free" oddly placed because in the previous paragraph movies, which I consider to be art, are suggested to be better for consumers to not have DRM. 12:42 pdurbin "artists deserve the right to control distribution of their work" but not movie makers? 12:44 pdurbin Phew, I think that's it. 12:44 pdurbin Again, over all, an interesting essay. 12:45 pdurbin I'm realizing I don't have a great way to comment on longish articles like this. 12:45 pdurbin I mean, I could copy and paste the whole thing into a Google doc and leave comments on specific lines. 12:45 pdurbin That's probably what I'd do at work. 12:46 pdurbin But in the spirit of free software I figured I'd just start typing here and see where it takes me. At least the words I'm typing are being preserved in a plain text format by philbot, the IRC logger. 13:19 aditsu Crapple is the worst, I don't understand why anybody is willing to use their "products"
13:20 pdurbin Black Mirror is one of those "Netflix original" shows. I think I've watched three episodes total. Can watch in any order since they're stand-alone, which is nice. 13:23 pdurbin What do you use OpenDocument for? I pretty much only use Markdown. 13:26 pdurbin I mean that I always write stuff in plain text. Does OpenDocument save in a binary format? 13:26 aditsu pdurbin: do you ever use spreadsheets? 13:27 pdurbin Ok, so similar to docx. I use spreadsheets all the time but I use Google Spreadsheets. 13:29 pdurbin Sure. How do you edit your spreadsheets? With OpenOffice? 13:30 pdurbin I have it installed on my Ubuntu laptop. But not on this iMac at home or my Macbook at work. 13:31 pdurbin Yeah, but then I don't "own the content". 13:31 pdurbin Probably what I'd do is leave the comment in my wiki and then copy and paste it as a comment. 13:31 pdurbin ...on the article. 13:36 aditsu so you don't want you words to appear anywhere on any system that you don't control? 13:36 pdurbin Does that make sense? 13:38 pdurbin Why would I pour my heart into writing up content that might go dark and lost forever? Wouldn't that be a waste of my time? 13:40 pdurbin Yeah, this copy is probably good enough. If I invest time in writing up a thoughful comment, I might save that copy also. 13:41 pdurbin Generally, if I put effort and thought into something I write, I care about it. 13:41 pdurbin But yeah, it totally depends on how much effort I put in. 13:41 pdurbin Stuff I write in this channel is much more throwaway. 13:42 pdurbin But I like logging it so I can reflect on it in case someone says something interesting. 13:45 pdurbin I guess I could just copy and paste what I wrote above but I don't think that would make the best comment. 13:48 pdurbin aditsu: as a vi user, LibreOffice strikes me as somewhat heavyweight for editing spreadsheets. If it's just data I'm editing, I often use vi and a tsv file (and https://github.com/pdurbin/vim-tsv ). Are there any console-based apps for editing LibreOffice spreadsheets? 13:50 pdurbin Ok. How many different applications can be used to edit these spreadsheets? Just LibreOffice? 13:54 pdurbin yeah, TextEdit lets you save in odt format. But again, I always save in plain text if I can. Plain text is better for preservation. 14:08 pdurbin Well, I keep my resume in Markdown format, for example. It has some light formatting such as bullets and headers. In practice I just turn it into HTML and copy and paste it into something like Google Docs to make a PDF to send around. 14:11 pdurbin I've been thinking of putting that Markdown file for my resume in my wiki because something changed with LinkedIn during the last year or two where you can't see my profile unless you're logged in. Concretely, I would change "You can read more of my work history on LinkedIn" at http://wiki.greptilian.com/about/pdurbin to something like "You can check out my resume (link)" and have it in my wiki. 14:46 aditsu I really need to add a "one-liner" mode to CJam, and implement regexes..
14:55 pdurbin Why "cherry jam"? Tastes good? 15:06 pdurbin "Your comment is awaiting moderation." ... I basically linked to these IRC logs: "Nice essay! I left some comments at http://irclog.greptilian.com/sourcefu/2018-07-14 and http://irclog.greptilian.com/sourcefu/2018-07-15 and I apologize for not taking the time to write them up as a thoughtful post here." 15:11 aditsu used to? what happened? 15:16 pdurbin I'm looking to see if I ever did a proper write up of why I shut it all down. 15:20 pdurbin I made a todo to write it up. 15:21 pdurbin I'm a fairly frugal person so I paying for the domain year after year was probably part of it. And I'm sure eventually the IRC channel was just me talking to myself. 15:23 pdurbin I bet at the time I was really into https://indieweb.org (where I met bear) and I thought my little effort was redundant. I stopped hanging out in their IRC channel though because I wasn't in love with the vibe. No offense to everyone but it smacked of group think to me. 15:24 pdurbin Probably what I should do is see if there's any other community out there of like minded individuals who also care about data liberation, about owning your own data. 15:26 pdurbin No kidding. But https://github.com/pdurbin/feedcritic for example is all about maintaining a spreadsheet (if a TSV file counts) on own computer(s). 15:29 aditsu btw, what do you do for backups? 15:30 aditsu that's a crapple thing, right? but do use an external disk? or what? 20:05 pdurbin The body of the question was this: "The system Python on Mac is still 2.x. 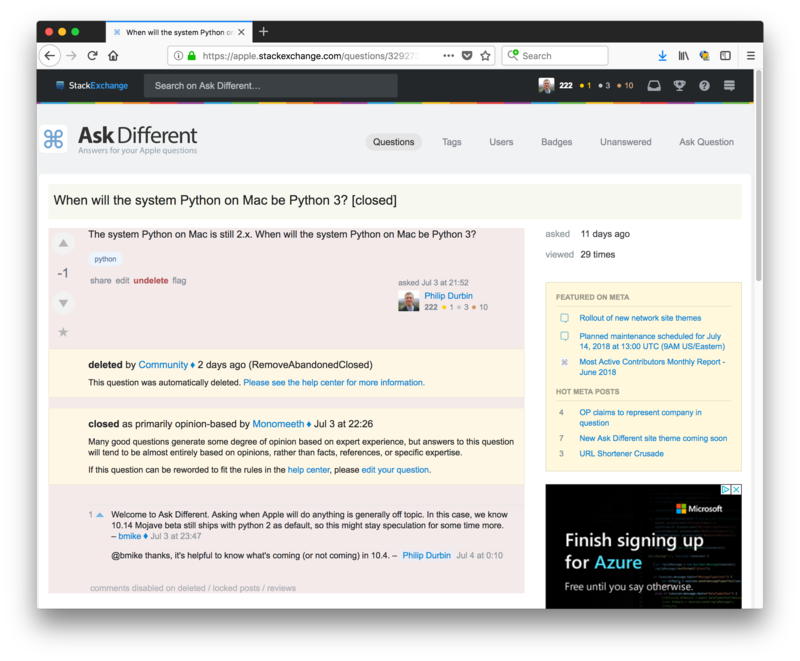 When will the system Python on Mac be Python 3?"